The roundtable was hosted by Honourable Kula Segaran, Secretary of PGA’s National Group in Malaysia and Member of PGA’s Executive Committee. Participants first discussed the situation of the death penalty in Malaysia, with opening statements from Mr. Raphaël Chenuil-Hazan, Executive Director of ECPM, H.E. Dr. Angela Macdonald, Acting Australian High Commissioner to Malaysia, and H.E. Mrs. Maria Castillo Fernandez, Ambassador & Head of the European Union Delegation to Malaysia, who all vowed to support Malaysian parliamentarians and authorities in their efforts to reduce the scope of the capital punishment. Most significantly, Hon. 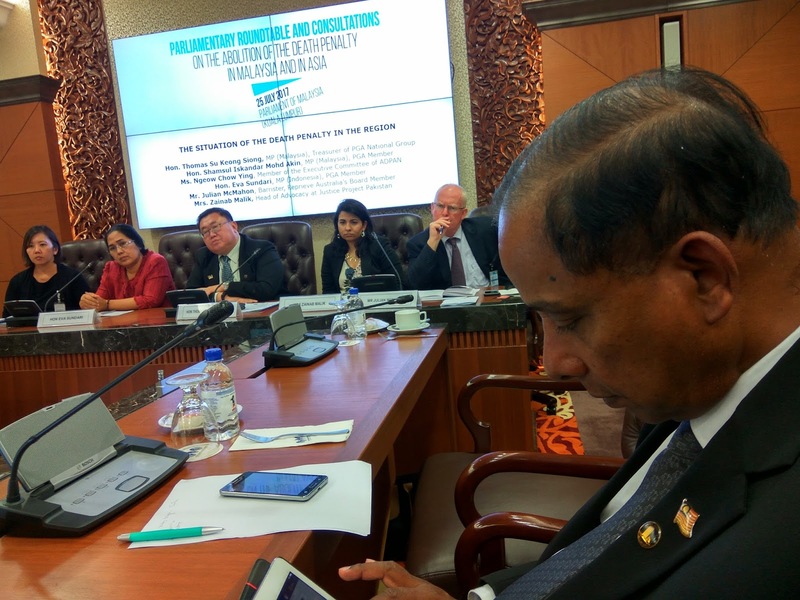 Azalina Othman Said, Minister of Law, described Malaysia’s efforts to reduce the use of death penalty and announced that a bill abolishing the mandatory aspect of capital punishment for drug-related crimes would soon be presented to the Cabinet, before being put to vote in Parliament. After substantive contributions from Hon. Kula Segaran, Mr. Charles Hector Fernandez, Coordinator of MADPET, Hon. 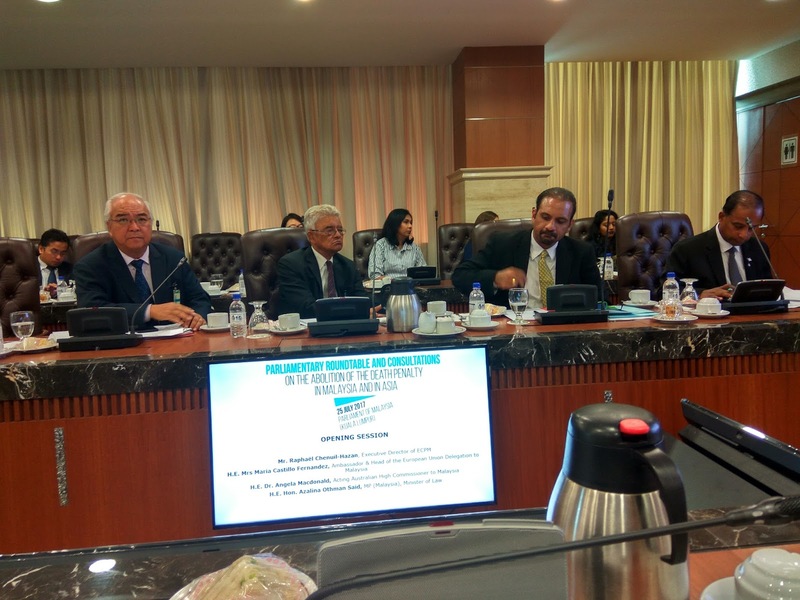 Liew Ching Tong, PGA Member, and Tan Sri Razali Ismail, Chairman of the Human Rights Commission of Malaysia (SUHAKAM), all attendants participated in a fruitful debate where they exchanged views on how to best promote the abolition of the death penalty in Malaysia. The roundtable also gave the participants an overview of the situation of the death penalty in other Asian countries, thanks to the very detailed presentations from Ms. Ngeow Chow Ying, Member of the Executive Committee of ADPAN, Hon. Eva Sundari, Indonesian MP and PGA Member, Mr. Julian McMahon Barrister and Member of Reprieve Australia’s Board, and Mrs. Zainab Malik, Head of Advocacy at Justice Project Pakistan. Chaired by Hon. Thomas Su Keong Siong, Treasurer of PGA’s National group in Malaysia, and Hon. 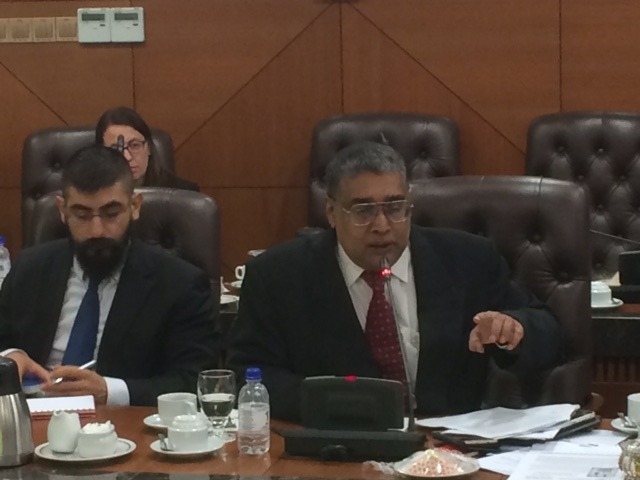 Shamsul Iskandar Mohd Akin, PGA Member, this session allowed all participants to identify similitudes and synergies between efforts led by parliamentarians in Malaysia, Indonesia, Pakistan and other countries in the region. All participants voiced their deep concerns at the increasing number of executions in Indonesia and Pakistan and at the multiplication of extrajudicial killing in the Philippines. They vowed to tackle the issue of the death penalty in their respective countries and on the regional level. The participants came out with the following Action Plan. 27. Demand that torture be expressly prohibited in Pakistani criminal law, that penalties and remedies be defined, and that a National Prevention Institution be created. “As parliamentarians, we have a role to play to go beyond vengeance” declared Hon. Shamsul Iskandar Mohd Akin, PGA Member. ** 3 ADPAN Executive Committee Members made presentations at this event.